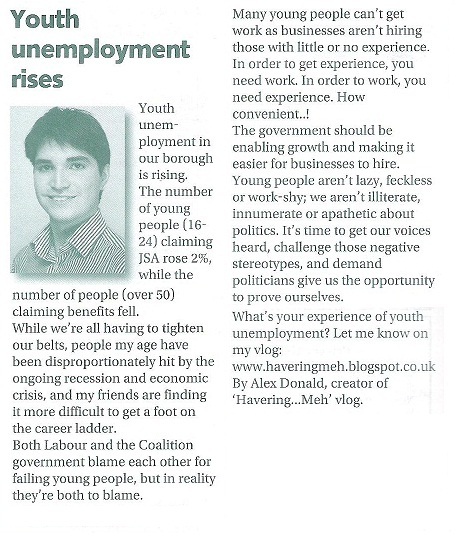 Below is my article from page 9 of this months Bulletin. 'In order to get experience, you need work. In order to work, you need experience.' That is certainly a common thread to many stories I've been hearing. It seems to me that the government should introduce some kind of compulsory work experience scheme (unpaid) for school children. It would be possible to opt-out, of course, but it wouldn't do you much good in the long run. Large companies would potentially be fined if they weren't offering a certain number of places per year (the number would be a suitable ratio compared to the paid workforce). Join HYR today - inspire a generation!